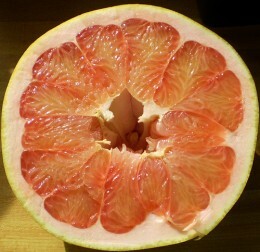 Pomelo is the biggest of all the citrus fruit; it is native to Southeast Asian countries. 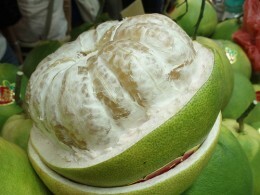 Pomelo can grow as large as 30cm in diameter and weigh up to 25 pounds. The pulp color varies from pale yellow to pink and red. The rind is very thick but soft and easy to peel away. Pommel has sweet and sour tastes but the membranes of the segments are bitter and usually discarded.